What are the benefits of studying art in the Early Years for pre-schoolers? The late 3’s to 4’s are a time of great revelations! It’s during this pre-school period that you realise those scissor skills you’ve been working at since your first fascination with scissors at age 2, can actually be used to change paper into particular shapes. Not just that, but those paper shapes can be put together to make pictures of things like trains and houses, even ice palaces. You begin to realise that, having enjoyed stirring paints together for a year or two, you can actually control the outcome of this process and make particular colours on purpose. Your prior learning becomes something that you consciously draw on to achieve new things. 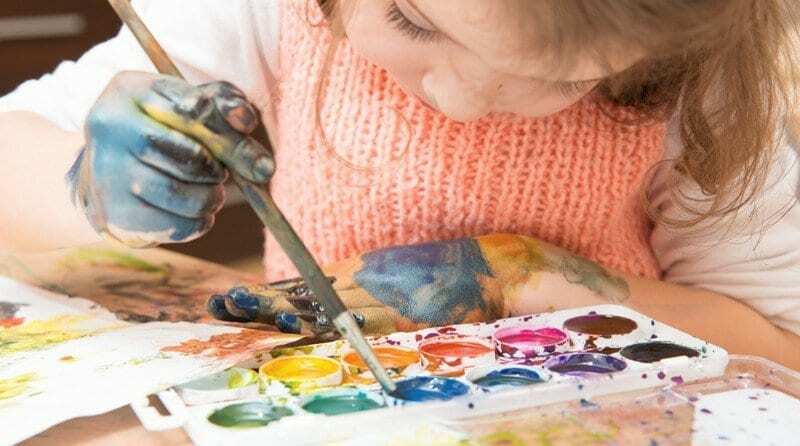 As an artist educator (my background is in sculpture so please forgive my omission of dance and music here as I write from experience), I believe that early years art sessions have a much broader scope than these few examples and can benefit pre-school children in so many valuable ways. 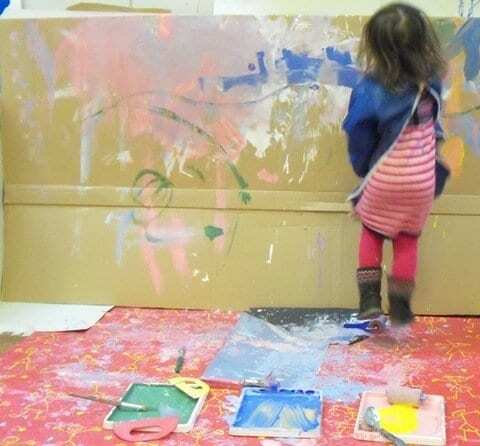 With its emphasis on process, exploration of possibilities and self-expression, art in the early years is about letting your imagination run wild. I love listening to the stories that children come up with when flicking through a book of art, either making up new stories or applying narratives that they’ve heard before (I recently observed a child using a renaissance painting of a shipwreck to re-tell the story of Jonah and the whale). Children see all sorts of things in the work of other artists – oceans and zebras in Bridget Riley’s wobbly op art paintings, thunderstorms and trees in Cy Twombly’s scribbles, or trains and rockets in Phyllida Barlow’s enormous sculptures – and are often inspired to make their own representations of the things they’ve seen or to work in similar ways to make models and pictures of their favourite things. 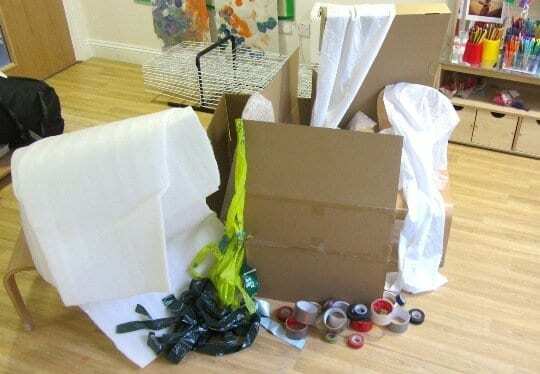 Using “loose parts” allows the children to invent their own uses for common materials and a sheet, for instance, can become a den or a canvas to paint on; it can wrap up piles of chairs to make a sculpture or it can even be used to wrap a person – after which they tend to become Elsa. Alongside inspiring the imagination, art in the early years provides endless opportunities for being creative and thinking critically. 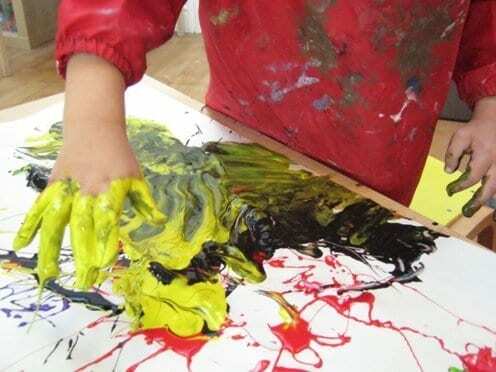 Art based learning experiences enable a child to test hypotheses, ideas and processes, often discovering new techniques by accident. The child can learn to creatively work out their own solutions to problems by trial and error (or vicariously so by watching their friends) following their own curiosity in deciding what to make and how. Art making always involves situations where prior learning can be applied – like those scissor skills I mentioned, or when choosing whether to use sticky tape or glue. So, as the pre-school child explores the materials at their disposal in their own unique ways, the art activity provides foundational learning with valuable future implications. In the excellent Art in the Early Years [Routledge Falmer, 2003] Kristen Ali Eglinton suggests that “sharpening of the senses, heightening perception, the giving of forms to ideas and thoughts, and the fostering of aesthetic awareness are some examples of what only art can contribute.” When using real flowers (maybe cut, maybe growing in the nursery garden) as a motivational element of an art making experience the aim is only partly to copy the flowers. The real aim is to fully explore the smells, textures, colours and shapes that make a flower beautiful and the ways that we can capture or represent these aesthetic experiences with pencils, collage, pastels or paint. An experience like this is a chance for pre-school children to look, consider, feel, respond, communicate and fully appreciate the world around them. The next way in which I believe art education is beneficial to pre-schoolers is that it nurtures the curiosity required to take an active role in their own learning. Just as no two adults making art will produce the same thing with the same resources, art in the early years should be equally non-prescriptive. In my pre-school art sessions I like to demonstrate how an artist might use the materials provided but then allow the children to play freely – as so many artists would – with the resources to hand and find their own ways of using them. Rather than working to create faithful copies of famous paintings, I try to keep the focus on finding out as much as possible about the tools and materials available and to discover all of the different things you can use them for. Some children will make abstract art, some architectural-type models, others may make props for role play – none of it inappropriate, or “naughty” or too messy. I often have to remind myself that there really is no such thing as too messy! Recently I witnessed one child making a painting by tipping watery paint backwards and forwards over some card in a tray. After about half an hour she had used all the colours, got excited about all the different mixtures, exclaimed over the patterns that she was creating and even seemed pleased that her painting (which had been a riot of brilliant coloured swirls) was completely brown. She didn’t really mind what her picture looked like once it dried. As she explored the process of making her painting her interest in what she was experiencing led her to learn about how colours mix and change, how paint flows and dribbles across a sloping surface, how she could affect the flow of paint by tilting the paper more or less steeply; she explored what happens if she tipped the tray back and forth really fast, and what happens if she put all the colours on the paper at the same time. She learned a bit about gravity, she talked about what she was seeing and she kept experimenting until she felt she’d exhausted all her options and in the end she was very proud of what she’d achieved. When finding motivational resources for art activities I avoid worksheets and templates to colour in and stick together, preferring to use real artworks to inspire children’s individual creativity (the above experience was inspired by the work of Holton Rower) which I hope, expands their cultural awareness. Seeing pictures of artists at work in their studios, or even visiting an artist if there are any studios nearby, demonstrates that Artist is a job, just like a Train Driver or Police Officer. It also introduces the children to culture beyond the TV programs and merchandise marketed at them, and through developmentally appropriate art activities, pre-school children can even begin to play an active role in this culture. By using a zoetrope, pre-school children can make their own animations, for example. Or they can use clay to make pots and bowls just like the ones we eat our dinner from. A trip to an art gallery can be followed up with an exhibition in your nursery or a local café where parents, grandparents, carers and siblings can admire the results of your pre-schoolers’ creative pursuits. In this way the early introduction to expressive arts and culture can lead to cultural empowerment. Finally, and perhaps most importantly, one of my primary objectives when facilitating pre-school art sessions is that the children who participate will grow in self confidence. Art is pretty unique in its provision of opportunities to learn new things without the fear of failure. When making art you can find it frustrating, you might even want to smash what you made (an important part of the creative process) but it can never really be wrong in the way that you can get counting wrong. When you’re experimenting with media, there’s no need to be precious about what you make. In fact, wouldn’t it be great if children could always make art in an environment that enables them to explore with abandon, allowing their individual learning styles, modes of expression and developing personalities to flourish unrestrained. With meaningful feedback, praise for their efforts and affirmation of the value of their process and products, I believe art in the early years can be a key contributor to the strengthening of every pre-school child’s self confidence and self-awareness. Because there is no such thing as failure in early years art, a child can learn that who they are, what they can do, how they express themselves and the ways that they instinctively relate to the world, are all inherently good and valuable, and will continue to be as they grow. Matthew Kay is an artist and early years art specialist with 16 years experience of delivering arts education in primary schools and nurseries. He facilitates contemporary art inspired learning experiences for nurseries and pre-schools in South West London, as Eyes Pie Arts. To find out more, visit his website here or email him.